Physical and mental. Let’s get the mental over first. In short, my cunning plan proved to be a turnip: yes, a hammer trumps a bead every time (ok, might take two or three careful blows) but, where my trial beads turned into glittering dust, those on the shawl shattered into shards. Sharp ones. After cheerfully demolishing about 20 beads I realised the fragments had cut the yarn in two places. I repaired them, but BMFA Silk Thread II is, well, silk: it doesn’t stick to itself, it’s thin and shiny and the repairs are visible). However, I was committed, so I continued much, much more carefully – the next c. 100 beads required only two more repairs. 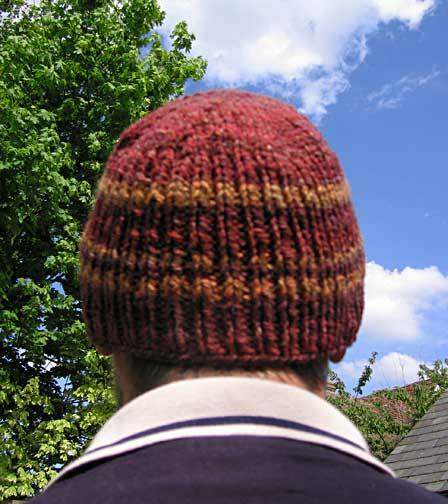 I sat in the sun with my heart sliding into my socks as I realised that, at this speed, I’d still be breaking beads in two weeks’ time, and the shawl would be a higgledy-piggledy mess of repairs. 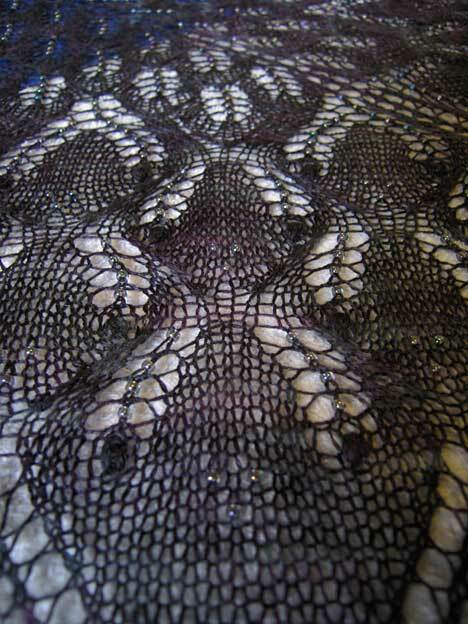 I looked at that beautiful silk gleaming in the light and realised that my selfishness had ruined that shawl and wasted weeks of my precious spare time. After all, if I didn’t like the glitter, I could have given it to someone who did. But no, I wanted that lovely yarn, that shawl sans beads for me. Therein lies the anguish: I was Stupid. And now I think no one will have it, even though after I announced that I’d binned it the Tsocksarina decided to attempt to salvage something from the wreck. As soon as its chaperones arrive (no knitting can travel unaccompanied) the mess will be on its way. Above, the view east along Rushup Edge. 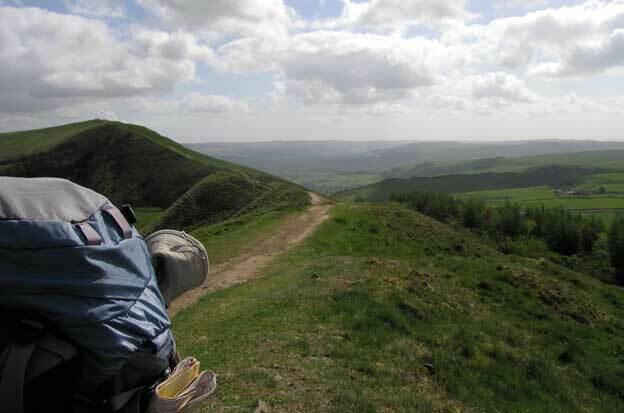 Mam Tor on left above my pack, Castleton at right. 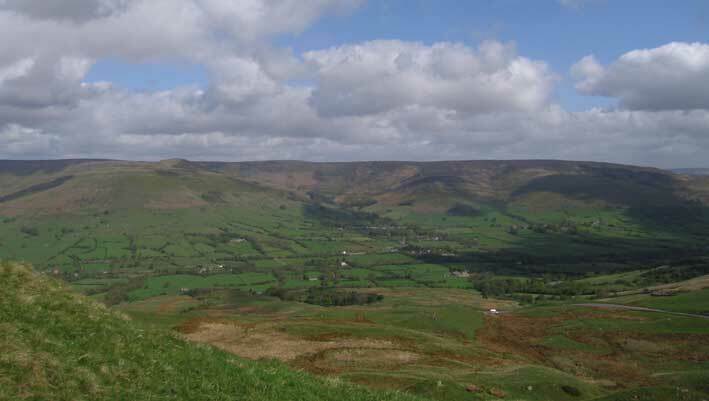 Below, the view north to Edale village and the Kinder plateau. 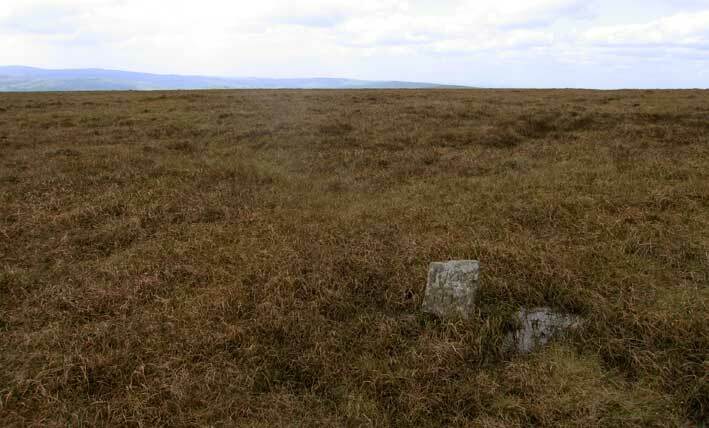 This Boundary Stone inscribed ‘1748’ lies on what fell-runners say is the driest line along the top of the moor. They’re probably right, but it was wet nonetheless. And I finally tested the depth of a bog hole: only 18″ or so in diameter, it was nearly 4′ deep! stop for lunch in the shelter of a quarry and stone wall (the wind was cold! 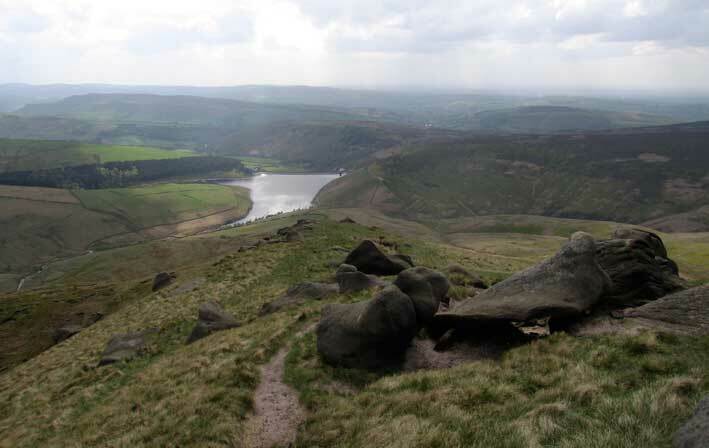 ), strike west along the flank of Kinder, then north until we had to decide: take the ‘easy, short’ path that slides up the western slope to the top of Kinder, or carry on around Kinder Reservoir and up William Clough to the far northwest corner of the plateau. For several minutes we fidgeted, thoughtfully shifting the packs on our shoulders, trying to balance time, pack weight, energy level, distance and knee condition, before basically saying ‘Sod it, we can eat at McDonald’s if the pub is full – let’s go!’ and committing to the lunacy of the longer route. Besides which, we were carrying tent, sleeping gear, water filter, stove, fuel, and food for 6 days. We could take our time. The view west from the top. Good but not quite good enough 🙂 The panorama was taken from the top of that long green hill above the dark trees on the left of the picture. The ridge in shadow to the left in the distance is Rushup Edge; in the middle distance is Brown Knoll. 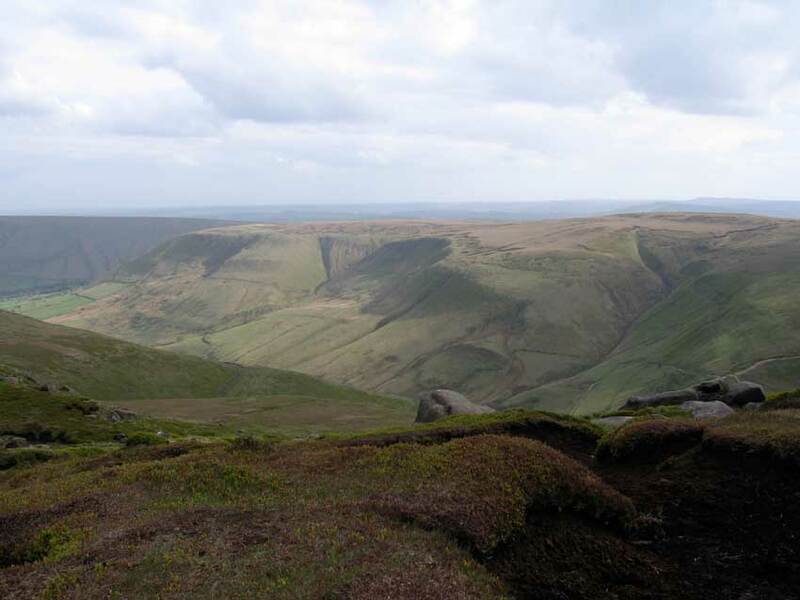 The blanket of peat on the flattish top of the hill is clearly visible, broken up at the edges by erosion and by old peat cuttings. You can also clearly see some of the post-glacial landslips for which Edale is famous. As we strode, kneesore but determined, we discussed the best route down. The plateau stands about 300m above the floor of the valley; given the weight on our backs and the condition of our knees, were we better trying to lose height as quickly as possible (the c. 75° drop down the rockfall of Grindsbrook Clough), or more slowly (the unfamiliar path down Grindslow). We opted to get it over with and paused for an SIS isogel (those things work wonders when you need a quick boost of energy for a specific task) before carefully making our way down the rockfall. The energy ran out about halfway down the path to Edale, but it didn’t matter, we were down. End result: over 15 miles/24k, roughly estimated, including more ascent/descent than we’re likely to encounter on any day on the Sutherland Trail. Conclusion: we did it; we can do it again. Barring accidents, we’re up to the task, in every sense. And this morning? We’re fine. If we had a hill, we’d be up it 🙂 In the interim, I will do some lace knitting! This entry was posted in Uncategorized on May 3, 2009 by sarahw. Oh, the trials we put before ourselves in life! ‘Twould be dull without them, I suppose. 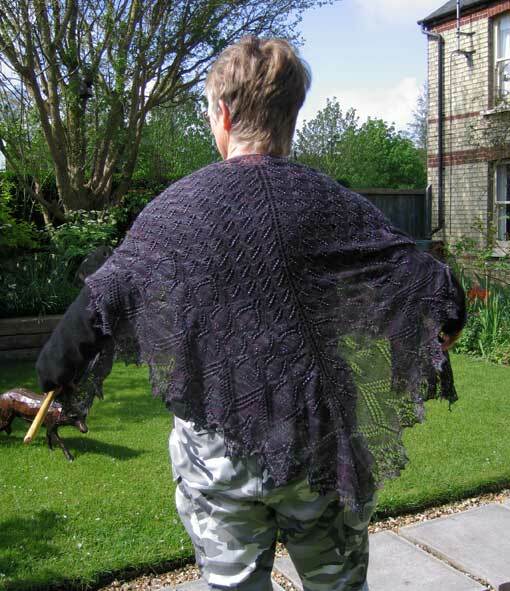 Lovely shawl, lovely walk. Too bad about the trials associated with each. It’s sad that the beads didn’t cooperate with your plan.